This forced civil society organizations to give a pressure to the government and the Maoist party. Under great pressure of civil society organizations, there was a loose political coalition between seven party alliances and Maoist which held a peace talk in New Delhi. The alliances and UCPN (M) came to the 12 point agreement which later include UCPN (M) in House of Representative and draft an interim constitution which was formed by a new parliament. The cabinet also introduced 33% quota for women parliamentarians. However, the constituent assembly election which was held in April 10, 2008, did not include the introduced women’s quota in the parliament. The CA election elected 240 electoral constituencies on the basis of a first past the post (FPTP). Another 335 members were elected on the basis of proportional representation and more 26 distinguished contributors were selected from the cabinet. Previously, there were only 205 constituencies but now has been increased by 300%, which is unnecessary and very costly. This money can be used to build a school in Rukum or Rolpa, one of the undeveloped places in Nepal. Now the politics in Nepal has been a “job” for people. "Armed Conflict and Internally Displaced Persons in Nepal." INSEC HR Report. INSEC, Nov. 2010. Web. 27 Nov. 2010. <http://www.inseconline.org/pics/1289800165.pdf>. 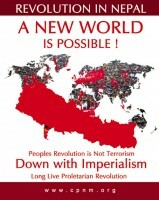 "Maoists want one party absolute rule in Nepal." Joshi, Govinda R.Interview. telegraphnepal.com 12 May 2010. Web. 23 Oct. 2010. <http://www.strategypage.com/http://www.telegraphnepal.com/news_det.php?news_ id=7666militaryforums/76-227.aspx>. "Schmitter, Philippe C., and Terry L. Karl. WHAT DEMOCRACY IS.AND IS NOT. 2nd ed. Baltimore & London: The Johns Hopkins University Press, n.d. 220-27. Print. Baral, Lok R. "The Return of Party Politics in Nepal." Journal of Democracy vol. 5. No. 1 (January, 1994): 121-33. Project Muse Web. 1 Nov. 2010. The Johns Hopkins University Press. <http://muse.jhu.edu/journals/jod/summary/v005/5.1baral.html >. Baral, Lok R. Foreword. Nepal in Transition: A Study on the State of Democracy. By Krishna Hachhethu, Sanjay Kumar, and Jiwan Subedi. Kathmandu, Nepal: International IDEA, 2008. N. pag. Web. 29 Nov. 2010. <himalaya.socanth.cam.ac.uk/collections/./IDEA_Nepal_in_Transition.pdf>. BBC News-Timeline: Nepal . BBC NEWS, 17 Feb. Web. 10 Mar. 2011. <http://news.bbc.co.uk/2/hi/south_asia/1166516.stm>. Bohara, Alok K., Neil J. Mitchell, and Mani Nepal. "Opportunity, Democracy, and the Exchange of Political Violence : A Subnational Analysis of Conflict in Nepal." Journal of Conflict Resolution 50.1 (2006): 108-28.DOI: 10.1177/0022002705282872. Academic Source Premium . Web. 14 Oct. 2010. <http://jcr.sagepub.com/content/50/1/108>. Devkota, Surendra R. "Socio-economic Development in Nepal: Past Mistakes and Future Possibilities." South Asia Economic Journal vol. 8.2 (December, 2007): pp. 285- 315. Academic Source Premier DOI: 10.1177/139156140700800206. Web. 25 Oct. 2010.<http://sae.sagepub.com/content/8/2/285 >. Ganguly, Sumit, and Brian Shoup. "Nepal: Between Dictatorship And Anarchy." Journal of Democracy 16.4 (2005): 129-43.Project Muse DOI: 10.1353/jod.2005.0062. The Johns Hopkins University Press Web. 27 Nov. 2010. <http://muse.jhu.edu/journals/jod/summary/v016/16.4ganguly.html>. Kamal, Simi. "Democratization and poverty Alleviation ." Democracy Forum 2000. Kathmandu , Nepal. Sept. 2000. Web. 26 Nov. 2010. <http://unpan1.un.org/intradoc/groups/public/documents/APCITY/UNPAN002878.pdf>. Leve, Lauren G. "“Failed Development” and Rural Revolution in Nepal: Rethinking Subaltern Consciousness and Women’s Empowerment." Project Muse, Vol. 80.1 (winter 2007): pp. 127-72. DOI: 10.1353/anq.2007.0012. George Washington University Institute for Ethnographic Research. Web. 31 Oct. 2010. <http://muse.jhu.edu/journals/anq/summary/v080/80.1leve.html>. Luitel, Shom Prasad. "The Maoist People’s War and Human Rights in Nepal." Asia Folk School Online Magazine 10 Oct. 2001. Web. 26 Nov. 2010. <http://afs.ahrchk.net/mainfile.php/article/15/#>. Ranjitkar, Siddhi B. "One Hundred Days." Kathmandu Metro 30 Nov. 2008, issue 48 ed. Web. 10 Mar. 2011. <http://66.7.193.115:8080/kathmandumetro/news-analysis-and-views/one-hundred-days-of-maoists2019-rule-in-nepal>. Riaz, Ali, and Subho Basu. "The State-Society Relationship and Political Conflicts in Nepal (1768-2005)." Journal of Asian and African Studies 43.1 (2007): 124-42. DOI:10.1177/0021909607074863. Academic Source Premium. Web. 14 Oct. 2010. <http://jas.sagepub.com/content/42/2/123>. Routledge, Paul. "Nineteen Days in April: Urban Protest and Democracy in Nepal." Sage Journal Online: Urban Studies Journal Limited (2010): 1279-300. DOI:10.1177/0042098009360221 .Web. 14 Oct. 2010. <http://usj.sagepub.com/content/47/6/1279>. Sarup, kamala. "Nepalese People do not Want War." Strategy Page: Military Forum. Scoop Media, 25 Nov. 2004. Web. 21 Oct. 2010. <http://www.strategypage.com/militaryforums/76-227.aspx>. Thapa, Gagan B., and Jan Sharma. "From Insurgency to Democracy: The Challenges of Peace and Democracy Building in Nepal." International Political Science Association (IPSA) Review March 2009 vol. 30: 205 30.2 (2009): pp. 205-19. Academic Source Premier DOI: 10.1177/0192512109102437 . Web. 25 Oct. 2010<http://ips.sagepub.com/content/30/2/205.refs.html>. Yadama, Gautam N., and Don Messerschmidt. "Civic Service in South Asia: A Case Study of Nepal." Association for Research on Nonprofit Organizations and Voluntary Action. DOI: 10.1177/0899764004270512 33.1 (2004): 98-126.Academic Source Premium.Web. 14 Oct. 2010. <http://nvs.sagepub.com/content/33/4_suppl/98S>.